Nope, this isn't a camping trailer from outer space. It's an 86-square foot off the grid home called the Ecocapsule. It's so energy efficient and self-sustaining it will allow you to live virtually anywhere on the planet. The egg-shaped abode is a project by Slovakia-based Nice Architects. It has been in the works for seven years and finally it’s coming to full fruition. While you can't buy one of these capsules yet, Nice says they will be accepting pre-orders for these micro-shelters by early next year. 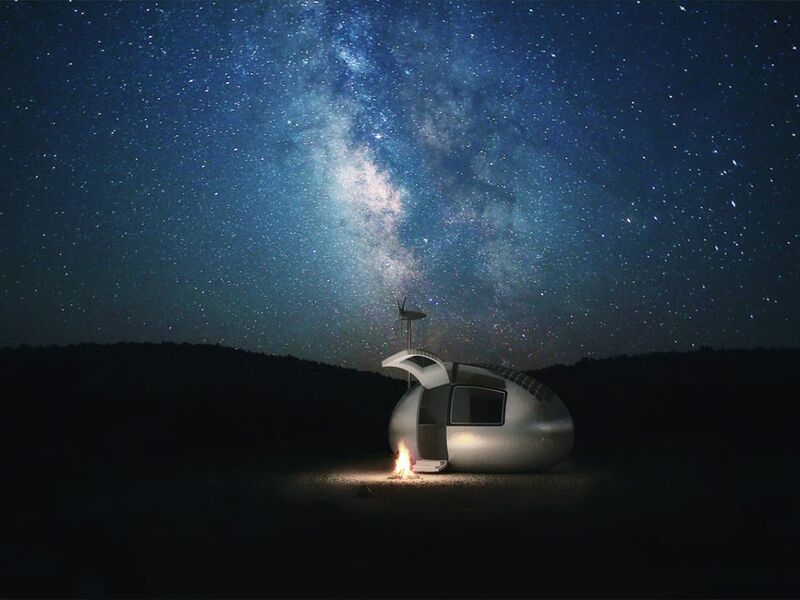 The Ecocapsule is an energy efficient home that doesn't skimp on creature comforts and convenience features, which is kind of surprising for an off-the-grid home that's less than 100-square feet. The Ecocapsule packs sustainable features that make living off the grid a whole lot easier. It generates its electricity via a rooftop solar array and a silent wind turbine. It also has a rainwater collection and filtration system that supplies drinkable water. If you're looking for something mobile, this tiny home can be hitched to a trailer and easily hauled by a truck or pack animal according to the Ecocapsule website. FYI, we don't support doing the latter. While this self-powered home can allow you to live anywhere, it also makes a great backyard bonus room. Who wouldn't want an egg-shaped retreat, home office or granny pad? While the Ecocapsule has a small footprint that measures 86-square feet, the designers of this tiny pod state it's a cozy abode built for two. It's compact interior will virtually leave you feeling as snug as a bug. Inside you will find a composting toilet, shower, kitchenette, dining slash work area and a full-size foldout bed. The space also has built-in internal and external storage, and two large windows.